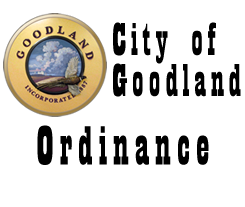 AN ORDINANCE REGULATING THE TRAFFIC WITHIN THE CORPORATE LIMITS OF THE CITY OF GOODLAND, KANSAS; INCORPORATING BY REFERENCE THE “STANDARD TRAFFIC ORDINANCE FOR KANSAS CITIES,” EDITION OF 2017; PROVIDING CERTAIN PENALTIES AND AMENDING AND REPEALING SECTION NO. 16-101. SECTION 1. INCORPORATING THE STANDARD TRAFFIC ORDINANCE. There is hereby incorporated by reference for the purpose of regulating traffic within the corporate limits of the City of Goodland, Kansas, that certain Standard Traffic Ordinance known as the “Standard Traffic Ordinance for Kansas Cities,” Edition of 2017, prepared and published in book form by the League of Kansas Municipalities, Topeka, Kansas. No fewer than three copies of said Standard Traffic Ordinance shall be marked or stamped “Official Copy as Adopted by Ordinance No. 1706,” and to which shall be attached a copy of this ordinance, and filed with the City Clerk to be open to inspection and available to the public at all reasonable hours. The Police Department, Municipal Judge and all Administrative Departments of the City charged with enforcement of the ordinance shall be supplied, at the cost of the City, such number of official copies of such Standard Traffic Ordinance similarly marked, as may be deemed expedient. SECTION 2. REPEAL. Section No. 16-101 is hereby amended and repealed. SECTION 3. EFFECTIVE DATE. This ordinance shall take effect and be in force from and after its publication in the official City Newspaper. PASSED AND APPROVED this 17th day of July, 2017, by the Governing Body of the City of Goodland, Kansas.